Physical and chemical properties of materials can change due to premature aging caused by external influences such as atmospheric oxygen, temperature, ultraviolet radiation (light), or chemical/biological media. Proper aging inhibitors or stabilizers delay the aging process and extend the induction period, which is the duration before the commencement of thermo-oxidative decomposition. The Oxidative-Induction Temperature or Oxidative-Induction Time (OIT) is the key indicator of the oxidation stability of plastics, fuels, lubricants, fats, or oils. It can be identified by using differential scanning calorimetry (DSC) in standardized procedures. There two different techniques are employed in practice, namely dynamic and isothermal OIT tests. 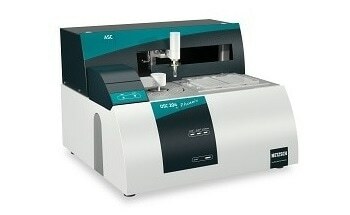 The dynamic method involves heating of the sample under oxidizing conditions at a defined constant heating rate until the onset of the reaction. The corresponding Oxidative-Induction Temperature, also known as Oxidation Onset Temperature (OOT), is equivalent to the extrapolated onset temperature of the exothermal DSC effect taking place. The isothermal technique involves heating of the sample under a protective gas, followed by maintaining the sample at constant temperature under protective gas for several minutes to reach equilibrium and subsequent exposure to an atmosphere of oxygen or air. The duration from the first contact with oxygen until the onset of oxidation is defined as OIT, as shown in Figure 1. 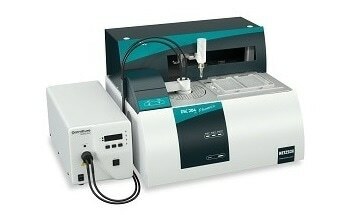 A high-pressure DSC instrument, such as a NETZSCH Pressure DSC 204 shown in Figure 2, is generally used for the oxidation analysis of lubricating oils and greases. The sample evaporation is prevented by generating a back-pressure of 35 bar. In oxidation reactions, since the oxygen not only generates pressure but also serves as a reaction element, great care must be taken to accurately regulate both the pressure and the gas flow. Moreover, since the oxidation stability determination is surface sensitive, the oil or grease sample must ideally have a smooth, uniform surface so as to get reproducible test results. According to ASTM D6186 for lubricating oils and ASTM D5483 for lubricating greases, solid fat index (SFI) crucibles, as shown in Figure 3, are ideal for such analyses. Pan-shaped aluminum crucible with a volume of 85 µl and an outer diameter of 6.7 mm which can be formed with a sealing tool built into a standard crucible press, as shown in Figure 4, is an example for these crucibles. In flat-bottomed crucibles, fats and oils tend to creep towards the rim zones at elevated temperatures, resulting in size reduction of the sample’s effective surface that can interact with the surrounding atmosphere. This, in turn, affects the OIT results, as depicted in Figure 5. The blue curve represents the analysis carried out in a standard crucible and the resulting OIT time (extrapolated onset) is 64.6 min. The green curve represents the analysis performed in an SFI crucible and there is a considerable reduction in the OIT time (46.4 min) because of the larger effective surface. Using DSC-OIT tests, it is possible to obtain comparative conclusions on the stability of materials against thermo-oxidative attacks. The combination of the NETZSCH High-Pressure DSC 204 and SFI crucibles are well suited for the analysis of lubricating oils and greases.